God finds joy in all His creation and He remarkably calls each human being by name into His service. My call into religious life convinces me of the Word of God in Jeremiah 1: 4 – 5: “I chose you before I gave you life, and before you were born I selected you to be a prophet to the nations.” I truly believe that God has a purpose and a plan for each and every one of us. As St. Augustine said, "Our hearts are restless until they rest in God." 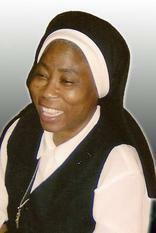 I have found the joy and purpose of my life since I said yes to God’s call into religious life. Becoming an Oblate Sister of Providence is one of the nicest things that has ever happened to me. God used the OSP formation director at that time to bring me where I am today. When I heard about the Oblate Sisters, their charism (which is rooted in God’s providence) and ministry (directed towards the marginalized of our world), I was motivated to enter their community. God’s providential care of me came in the form of a US visa in November 2000. I left my native country of Nigeria for the United States in the Fall of 2001. It was hard to leave behind my family, friends and job (as a bookkeeper). But I did go, because the will of God is my strength. I thank God unceasingly for allowing me to partake in the special ministry of Jesus. I am equally grateful to my family for their courage and support which made the transition into religious life a joyful one. My community, individually and collectively, has also blessed me abundantly on my journey. I have been engaged in pastoral work at St. Gregory the Great Church for more than seven years now. I so much love the ministry because it grants me the chance to see God everyday in the people I serve. I am very grateful for my vocation, and I ask God to bless all those who have been a part of my journey.